State delegates, party members, and reporters filled nearly every seat in Convention Hall during the 1928 Republican National Convention. The original Convention Hall building in 1900, just a few months before it burned down and was rebuilt in time for the Democratic National Convention. 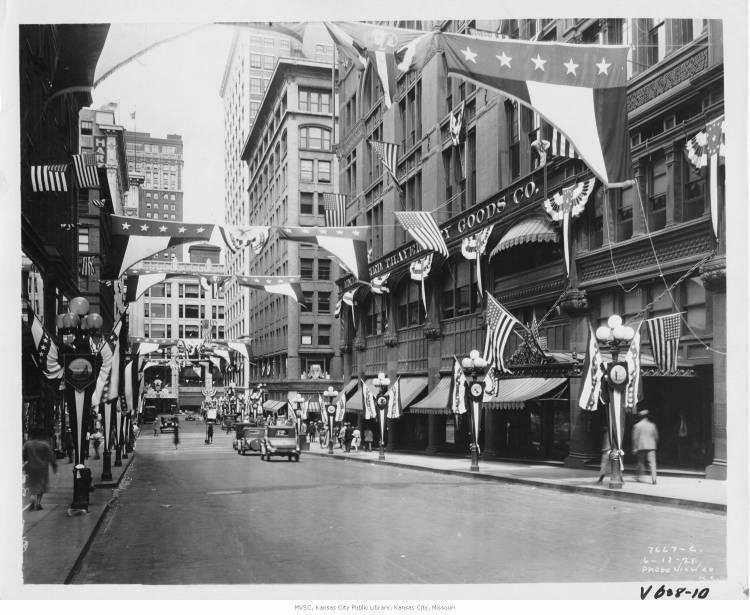 These buildings at 11th and Grand, and many others in Kansas City, were decked in American flags for the 1928 Republican National Convention. 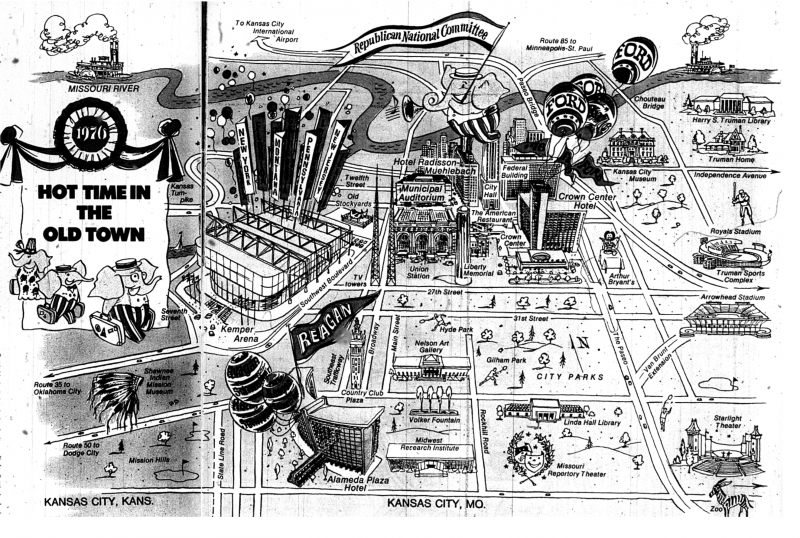 A cartoon map that shows off many of the major landmarks and important areas in 1976 Kansas City. The Republican National Committee is eyeing Kansas City as a potential site for the 2016 Republican National Convention, and after a visit last week, the delegates’ first impressions seem positive. The committee likely won’t release its decision until August, but with Kansas City buzzing at the prospect of another national convention, we thought it would be a good time to look back at the previous times Kansas City played host to national political conventions. The two major political parties started holding national conventions in the mid-1800s. Kansas City hosted the Democratic National Convention in 1900, and the Republican National Convention in 1928 and 1976. William Jennings Bryan, who later played a key role in the Scopes Monkey Trial, earned the Democratic presidential nomination with little competition at this convention. Adlai Stevenson was nominated as Bryan's running mate, but the pair ultimately lost to William McKinley in the 1900 election. The original Convention Hall at 13th and Central, built with the intention of hosting the convention, was finished in early 1899. On April 4, 1900, just three months before the delegates and visitors were set to descend on Kansas City , a fire destroyed the building. In a massive effort, Convention Hall was redesigned and rebuilt just in time for the convention. Local and national newspapers touted the accomplishment as evidence of the "Kansas City spirit." Almost 28 years later, the city's resilience after the tragedy was used again to draw the Republicans. With nearly perfect weather greeting delegates and visitors, the 1928 RNC went off seemingly without a hitch. Herbert Hoover and Charles Curtis were nominated, and eventually won the election during the Great Depression. 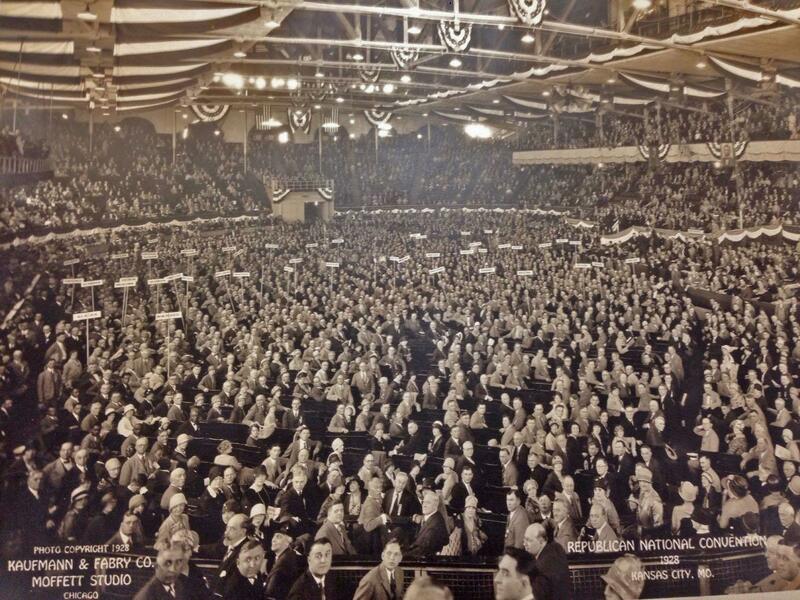 This was the last national convention that would be held in the Convention Hall, which was demolished when Municipal Auditorium was built in 1935. The decision to hold the RNC at Kemper Arena brought mixed reactions, as the West Bottoms were nearly vacant at the time. Still, spirits were high, with a Harper's magazine article describing it as, "Prime-time bacchanalia." One issue of concern was the lack public transportation options, something the city is dealing with again as they make their case for 2016. "The Convention Host Committee and Republican party's Arrangements Committee are pleased so far with the smoothness of pre-convention activity," Henry Clay Gold wrote in the Kansas City Times. "Still untested is the transportation system for the delegates, alternates, guests and press entourage." Concern over transportation issues soon fizzled out, as attention turned to the candidates, in what ended up being the last time a presidential nominee was decided at a convention. 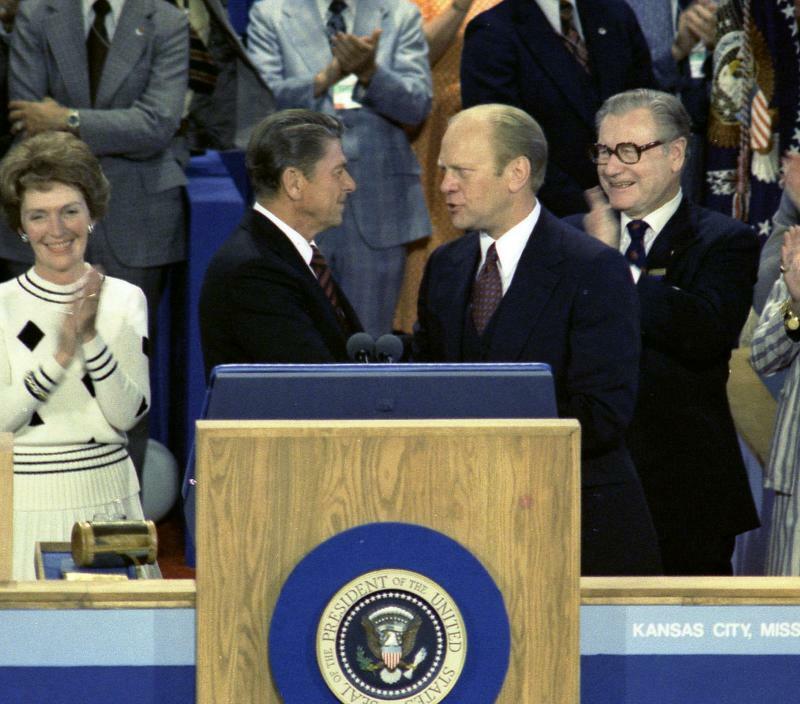 Gerald Ford became president when Richard Nixon resigned in the face of the Watergate scandal, but he still faced a strong challenge for the nomination from Ronald Reagan. Ford ended up winning with Kansas Sen. Bob Dole as his running mate by just more than 100 votes, but failed to overcome Democrat Jimmy Carter in the ‘76 presidential election. City leaders spent Thursday courting a delegation from the Republican National Committee in hopes of a securing a bid for the 2016 convention. So far, the RNC is impressed. "We've had children out to lead us in the pledge of allegiance. We had the high school band out on the tarmac to greet us. We had another young lady who just sang beautifully for us," says former Utah Congresswoman Enid Mickelson, the chairwoman of the site selection committee. "Those are the kind of traditional values clearly you have in Kansas City, and we think are important to spotlight." Kansas City is getting the once-over this week from members of the Republican National Committee, who are in town to see whether we have what it takes to host the party’s 2016 national convention. The last convention here came in 1976, and it was a hummer: A candidate named Ronald Reagan was taking on the incumbent president, Gerald Ford, and the battle went down to convention week. Officials in Kansas City, Mo., may be clamoring to host the 2016 Republican National Convention. But social media buzz in Kansas City wasn’t always as welcoming, according to feedback we received this week in KCUR’s informal polls. On Wednesday, convention selection committee members began their site visit in Kansas City, one of the four finalists competing to host the convention.